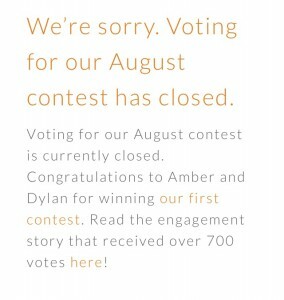 Thanks to all our friends and family who love us (and vote for us) we won the contest on Our Engagement story! Here’s the fun congratulations page!! A couple weeks ago I shared that we were entered into a contest. I was a little nervous because when I realized it was going on I was a few days late and the lead was already 14% ahead. But thanks to the power of social networking and your support of sharing it we jumped up real quick and it was back and forth between our story and another for awhile. Thanks to those who faithfully voted everyday and shared it with their friends. Thanks also to the masterminds behind our engagement story, Rob and Sara, they’re doing a great job with the site, go check it out! We received nearly half of the 1,600 total votes! How awesome are you guys?! To read our engagement story go here or here. To view our engagement pictures go here.